Seven and Bars Classic Slot Guide & Review - Casino Answers! Sevens and Bars is a 3-reel, 1-line classic slot machine with multipliers developed by Rival. You can play the Sevens and Bars classic slot machine at This is Vegas Casino and Superior Casino. Sevens and Bars is a classic slot machine that features 7’s and bars of all things. 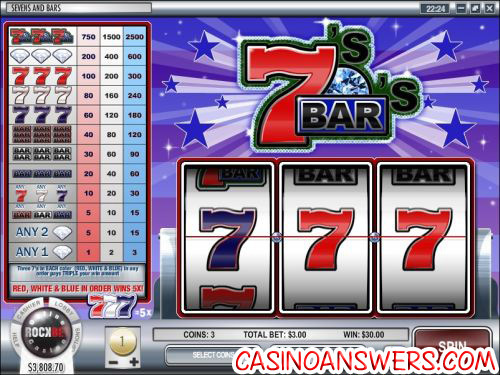 Symbols on the Sevens and Bars slot machine are: Diamond symbol, Single Bar symbol, Double Bar symbol, Triple Bar symbol, Blue Seven symbol, White Seven symbol, Red Seven symbol and Sevens and Bars symbol. There are 12 winning combinations in all on Sevens and Bars. To play the Seven and Bars slot machine, set your coin size unless you prefer to use the default $1 coin size. Coin sizes start at $0.01, followed by $0.05, $0.10, $0.25, $0.50, $1, $2 and $5. Once your coin size is set, select your number of coins between 1-3. If you wish to play all 3, you can spin the reels automatically using the “Bet Max” button. Once you have your bet set and are ready to play, hit the “Spin” button to spin the reels. There is an autoplay mode available for real money players at This is Vegas Casino. Seven and Bars’ top jackpot is the Sevens and Bars symbol. Three of these symbols on the center payline will win you 2500 coins on the maximum 3-coin bet. The Diamond is the second best symbol, worth up to 600 coins. If you’re able to hit a Red Seven symbol on the first reel, a White Seven symbol on the second reel and a Blue Seven symbol on the third reel in that order, your winnings will be multiplied by 5X! Red, White and Blue 7’s in any other order will pay out triple your winnings. Payouts on the Sevens and Bars slot machine are as follows (1/2/3 coin payouts in parenthesis): any 1 Diamond symbol (1/2/3), any 2 Diamond symbols (5/10/15), any 3 Bar symbols (5/10/15), any 3 Seven symbols (10/20/30), 3 Single Bar symbols (20/40/60), 3 Double Bar symbols (30/60/90), 3 Blue Seven symbols (60/120/180), 3 White Seven symbols (80/160/120), 3 Red Seven symbols (100/200/300), 3 Diamond symbols (200/400/600), 3 Sevens and Bars symbols (750/1500/2500). Play Sevens and Bars along with all of the other exciting Rival games (including the iSlots) with a $2400 signup bonus at This is Vegas Casino! Can American players play the Sevens and Bars slot machine? No, American players are no longer allowed to play at Rival online casinos. Instead, we suggest you check out a Slotland casino like Win A Day Casino for all your online gambling needs. Is there an instant play version of Sevens and Bars available? Yes, This is Vegas Casino offers an instant play version of their casino using Flash. If you encounter any problems with the Sevens and Bars Flash slot game, make sure you have the latest version of Adobe Flash Player installed on your computer. How much can I win playing the Sevens and Bars slot machine? On the maximum coin value of $5 while playing the maximum three-coin bet, if you hit three Sevens and Bars symbols on the center payline, you will win $12,500! What 7s slot machines are there? What classic slot machines with lucky sevens are there?